Watch the 2018 Compendium Release and EPM-RRTC State of the Science Event here! 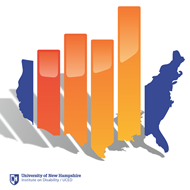 The Annual Disability Statistics Compendium, Annual Disability Statistics Supplement, and State Reports for County-level Data are web-based tools that pool disability statistics published by various federal agencies together in one place. When working on legislative and other matters relating to persons with disabilities, the Compendium, Supplement, and State Reports make finding and using disability statistics easier. The Annual Disability Statistics Supplement provides hundreds of additional tables breaking down the content found in the Compendium by age, gender, and race-ethnicity. The State Reports for County-level Data provide county-level statistics for each state complimenting the content found in the Compendium and Supplement. To view an accessible version of our PDFs, right-click to save the document to your computer and then open in Acrobat Reader or Acrobat Professional​. The Rehabilitation Research and Training Center on Disability Statistics and Demographics (StatsRRTC) facilitates evidence-based decision making in many different service and policy arenas to benefit persons with disabilities, leading to improved social outcomes. Large quantities of survey data and administrative records related to people with disabilities are collected each year. Yet these data lack continuity and are underutilized, leading to missed opportunities to improve the programs and policies that advance the lives of people with disabilities. Policymakers, program administrators, service providers, researchers, advocates for people with disabilities, and people with disabilities and their families need accessible, valid data/statistics to support their decisions related to policy improvements, program administration, service delivery, protection of civil rights, and major life activities. The Center's goal is to support decision making through a variety of integrated research and outreach activities by (a) improving knowledge about and access to existing data, (b) generating the knowledge needed to improve future disability data collection, and (c) strengthening connections between the data from and regarding respondents, researchers, and decision makers. In this way, the Center hopes to support the improvement of service systems that advance the quality of life of people with disabilities.